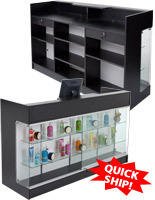 This retail sales counter will help keep employees organized! 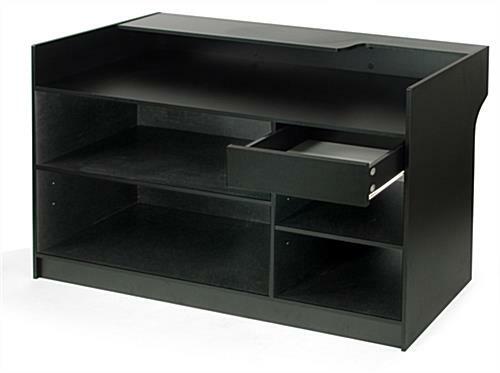 The cash wrap stand features a 6"h sliding drawer for storing pens, paperwork, and other items you may need at hand. 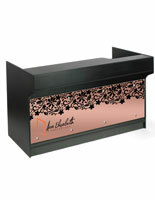 This black melamine sales counter is also sold with the option to buy an easily assembled black floral lace graphic panel for an even more elegant display! 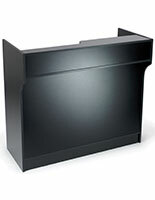 Each cash wrap area has a recessed well to conceal unsightly computer and electrical cords and also houses a convenient 8-3/4"d check writing shelf for customers. Underneath the sales counter is a large area for storing returned items or "on hold" merchandise, as well as bags or other packing materials. 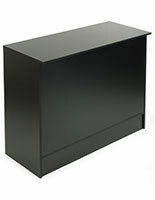 We supply this melamine checkout stand with two adjustable shelves, so you can change the height of access with ease. 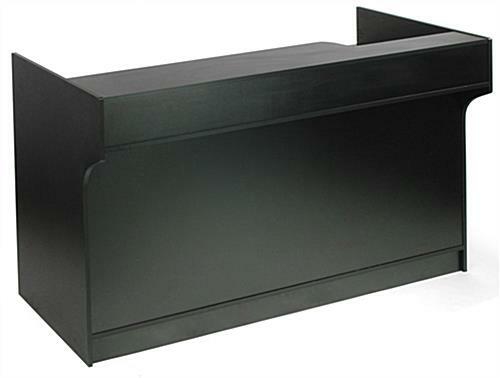 Choose from our inventory of display cases and cash wrap counters to create custom store fixtures. 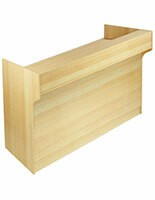 Please Note: We sell this retail sales counter unassembled (knocked down) to save you money on shipping costs. 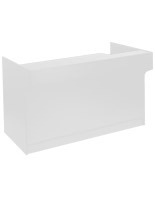 Included with these sales counters is a detailed instruction sheet. Assembly is simple, takes approximately 30 minutes, and requires an assistant. 72.0" x 42.0" x 22.0"
We absolutely love this countertop. Shipment was easy and after installation, it is the perfect size for our family-owned small business. I still have not received this item. I called spoke to a woman and she said she would call me back. I have not got a call back. Not sure this company will get anymore of my business. I just hope the product is better than their service! Hi Greg, We're sorry to hear of your situation. We strive to make sure we hear our customers and their concerns, so one of our customer care specialists will reach out promptly to assist. Thank you for your patience! 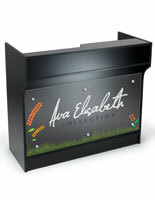 I'm glad I researched and found this company online to purchase this cash wrap to be used at my events as my official ticket booth. It adds professionalism to your events or business, it allows me and my staff to use it anywhere we host our events. 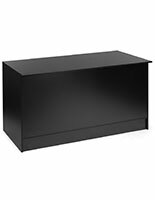 Thanks for this great product, the assemble instructions were readable and easy to assemble. I will be ordering real soon some other products on your website!